The best wedding favors are more than just little tokens of your love and appreciation for your wedding guests; they represent your acknowledgement of all the efforts that your family and friends have done to assist you throughout the course of wedding planning. From the aunt who helped you repair the sole of your heels to the best friend who gave you pep talks when wedding stress seemed overwhelming, you want to honor your loved ones for everything they’ve done for you. These are the exact reasons why you should choose the best wedding favors possible! One of the biggest mistakes brides and grooms make when choosing the best wedding favors is that they select cutesy knick-knacks that don’t really do anything for the guests. Sure, that little boat replica might look adorable with your nautical-themed wedding, but honestly, who really wants something like that hanging around their house? 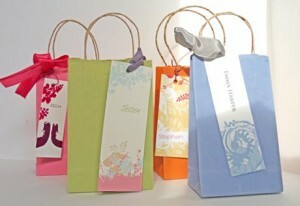 To avoid giving your wedding guests “clutter” wedding favors, think function instead of fashion. This means that you’ll want to choose wedding favors that can aid your wedding guests in performing everyday activities. A great idea can be a magnetic notepad that your guests can keep on their refrigerators. To make this a truly functional gift, avoid monogramming it with your newlywed initials. Instead, incorporate your wedding colors to ensure that more of your guests use your wedding favor. Here’s a great idea if you’re hosting a vintage-style wedding: instead of a notepad, opt to give your guests the gift of a stationary set. This is a unique and touching gift that may even encourage your guests to write a few letters to loved ones around the world. And hey, everyone loves to receive letters – so why not give your guests the excuse? Ultimately, the best wedding favors represent the middle ground between a functional gift and one that honors the look and feel of your wedding ceremony and reception. Once you’ve met this middle ground, you’ve officially found the best wedding favors for your guests. Don’t be afraid to get creative with your wedding favors. The more functional yet creative your wedding favors, the more impressed your guests will be! When it comes to planning out your big day, you want to focus on the fun details: what your wedding dress will look like, the look of pride and love in your sweetheart’s eyes as you walk down the aisle, how the champagne will taste as you toast to your future together. With this in mind, it’s no surprise that many brides-to-be would rather do anything but focus on menial tasks like creating seating charts and table place cards! While it’s certainly not as fun as picking out a wedding dress or planning a getaway with your bridal party, there’s no denying that mapping out seating charts is a vital part of ensuring a successful wedding. You want to make sure that your guests are as comfortable as possible, which means taking away the stress of trying to find seating for everyone. Be considerate of your wedding guests. You may have secret intentions of fixing up your single friends with your groom’s single friends, but it’s best not to push that during an hour-long dinner. Instead, seat people who know each other together. Lump together extended relatives with other relatives, college friends with other university buddies, and so on. As exhausting as it is, try to distance friends and relatives who may not like each other. You’ll be grateful for your extra attention to this detail when Auntie Lydia doesn’t steal your thunder by loudly arguing with Auntie Sarah. Always make the most of table place cards. These handy devices provide your guests with visual cues about where they need to sit. To help your guests find their tables, place their names and table numbers on the front of the table card. This can prevent any traffic from forming in the reception room with wedding guests attempting to find their seats. Incorporate your table place cards into the overall look and feel of your wedding. For example, if you’re going for a vintage feel, you might want to have your guests’ name written in a regal font. If you’re going for classic yet modern, choose a font that follows suit. You can even customize the colors and textures of your table cards for a truly unique touch. Remember, seating charts and table place cards are vital for ensuring that your guests can enjoy your wedding without the hassle of picking out their tables. 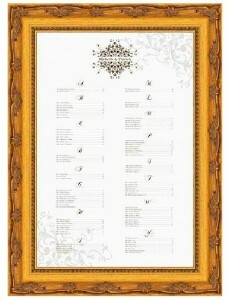 And be sure to check out all the beautiful table place card designs at SaveTheDateForLess.com.